Its time for another swatch post and today I shall be swatching the entire range of Colorbar Cheek Illusion Blushes. 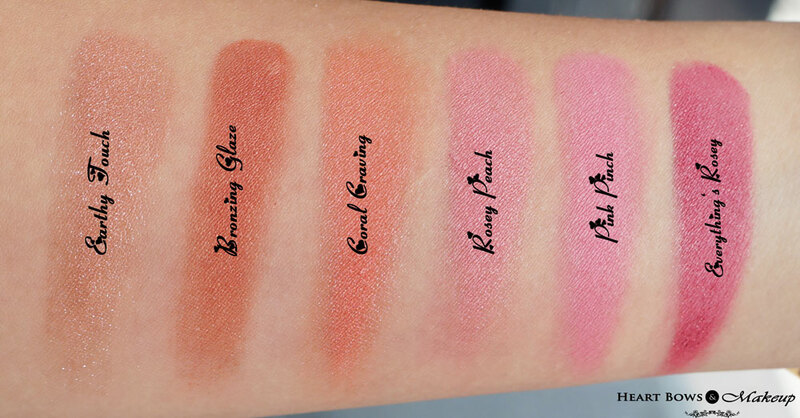 These are one of the best blushes available in India and come in a good variety of shades. 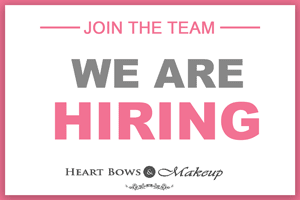 I have already reviewed Colorbar Cheek Illusion in Everything’s Rosey so don’t forget to check that out for more details on the quality. Colorbar Cheek Illusion Blush Earthy Touch Swatch: A neutral brown blush with a shimmer finish. This could be a great natural bronzer for some and the perfect highlighter for dusky beauties. Colorbar Cheek Illusion Blush Coral Craving Swatch: A beautiful orange-coral which adds a beautiful glow to the face. Coral lovers would totally fall for it. Colorbar Cheek Illusion Blush Rose Peach Swatch: A gorgeous warm pink blush with peach undertones. Like the rest of the blushes in the range this too contains fine shimmer. Colorbar Cheek Illusion Blush Pink Peach Swatch: A perfect pink blush which is not too pale nor too bright. This one does not contain any shimmer. Colorbar Cheek Illusion Blush Everything’s Rosey Swatch: A very pigmented medium pink with a plum undertone. Full review here. 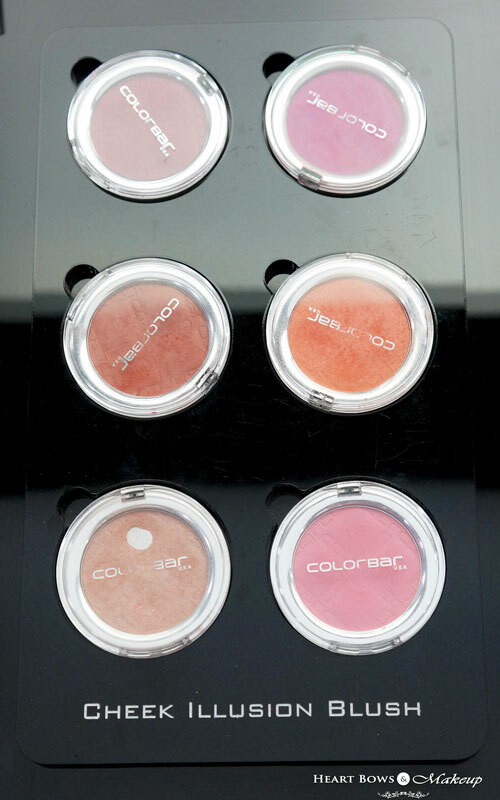 The Colorbar Cheek Illusion Blushes have a soft and satin texture with fine shimmer particles. They add a lovely glow to the face and give a staying power of 5 hours on an average. I love the shade selection but the price certainly could’ve been better! 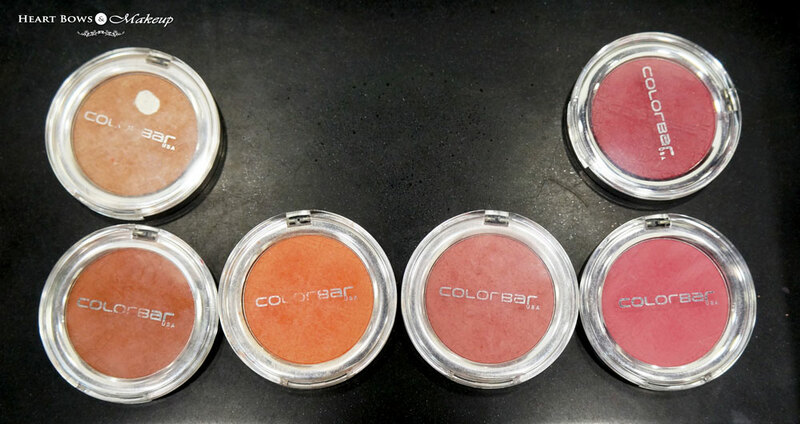 Have you used any of the Colorbar Cheek Illusion Blushes? Which are your favorite shades?